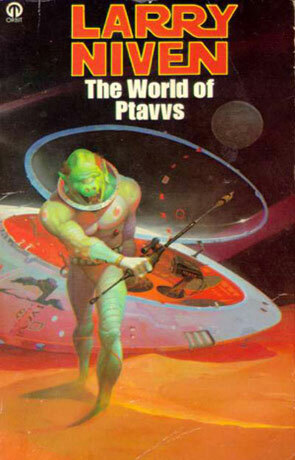 The World of Ptavvs is a classic science fiction novel by Larry Niven. A good old idea book from the good old days when a book didn't have to be 500+ pages – not that I don't like thick books, but once in a while it's nice to read something that you can actually see an end to. Ptavvs (how do you pronounce that? ), is based on the idea of a mind controlling alien who has an accident with his space ship and is forced to go into suspended animation for a couple of centuries while his ship costs towards an inhabited planet. A couple of not centuries, but million years later his is – much to his surprise – re-awoken on earth a century or two from our present day (no date is given, but we have space travel, flying cars and mega cities). Like I said in the first paragraph this is an idea book, which sometimes is a nice way of saying that the character in the story is as entertaining as eating chalk – this is one of those times. But there are a few good ideas and I found my self entertained by the story, all it takes in a small effort to ignore (or laugh at) the things in the book that may have seemed fresh in the sixties, but seem a bit cliché today. A couple of hours with rocket ships pushed to the limit and aliens that are not quite as intelligent as humans when you really get down to the important stuff – now that's what I call real Science Fiction.